Nobody told Reina Lemus de Zelaya that her job as a farmworker was hazardous not only to her health, but to her unborn child. So when Lemus de Zelaya was pregnant with one of her daughters, she continued working in the agricultural fields in Florida. Not only was she continually exposed to pesticides while pregnant, when her daughter was born she even brought her baby to the fields in a stroller. No one warned her to do otherwise. 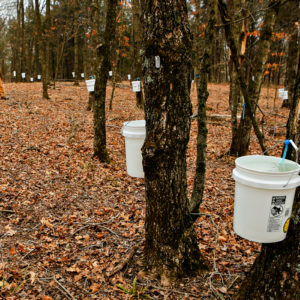 “When I was pregnant with my first child, there was a strong pesticide used in the fields but I had no idea it was going to affect my baby,” said Lemus de Zelaya. Her daughter was born with asthma, and struggled with it in school. She was diagnosed with learning disabilities. Lemus de Zelaya’s other children didn’t have any of these problems. The family doctor said these problems were caused by pesticide exposure, but he suggested she change jobs rather than speak out. “At that time I had no idea how to protect myself or my children from the risks of pesticides,” she said. 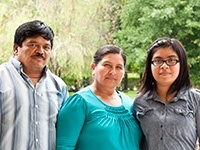 Two decades later, Lemus de Zelaya’s husband, Miguel, and their other daughter, Selena, 18, are joining several other farmworker families and advocates in a visit to D.C. this week to call on Congress to strengthen the Worker Protection Standard and implement stronger protections for farmworkers from hazardous pesticides. The federal government estimates there are 10,000–20,000 acute pesticide poisonings annually among workers in the agricultural industry. An estimated 5.1 billion pounds of pesticides are applied to crops annually in the United States, and our nation’s 1–2 million farmworkers face the highest threat from the health impacts of these chemicals. 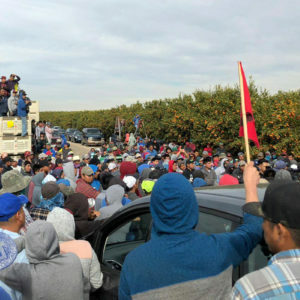 In Florida, there are only about 40 inspectors assigned to ensure that the approximately 40,000 agricultural operations in the state are complying with legal requirements and keeping the estimated 290,000 farmworkers in the state safe. Miguel Zelaya now takes it upon himself to wash his hands after coming in contact with pesticides and refuses to work in fields that have just been sprayed. He risks getting fired for those actions, but he says he is more concerned with his health. The Zelaya family is just one of the many families that Jeannie Economos of the Farmworker Association of Florida has known and worked with to secure better protections against pesticides. 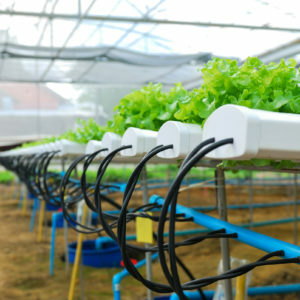 The federal government estimates that there are 10,000–20,000 acute pesticide poisonings annually among workers in the agricultural industry. Short-term effects of pesticide exposures include stinging eyes, rashes, blisters, nausea, headaches, respiratory problems and even death. Cumulative long-term exposures can increase the risk for farmworkers, their families and their children for serious chronic health problems such as cancer, birth defects, neurological impairments and Parkinson’s disease. Selena Zelaya worries about her parents possibly getting cancer or some other disease. “I don’t want them coming home sick just because the owners don’t take precautions for their safety,” she said. Tom Thornburg, managing attorney for Farmworker Legal Services of Michigan, hopes the issue of pesticide exposure becomes a topic more people are concerned with. This post originally appeared on Earthjustice. Cover photo: Miguel Zelaya, Reina Lemus de Zelaya and their daughter Selena Zelaya. Miguel and Reina are farmworkers in Florida. (Alex Saunders / Farmworker Association of Florida).